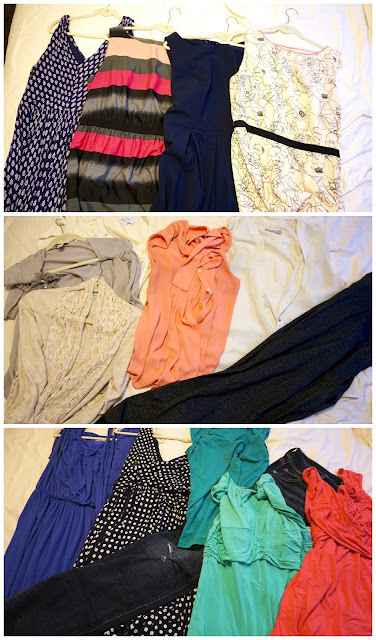 Last week I talked about the basis of a capsule wardrobe - finding your style. 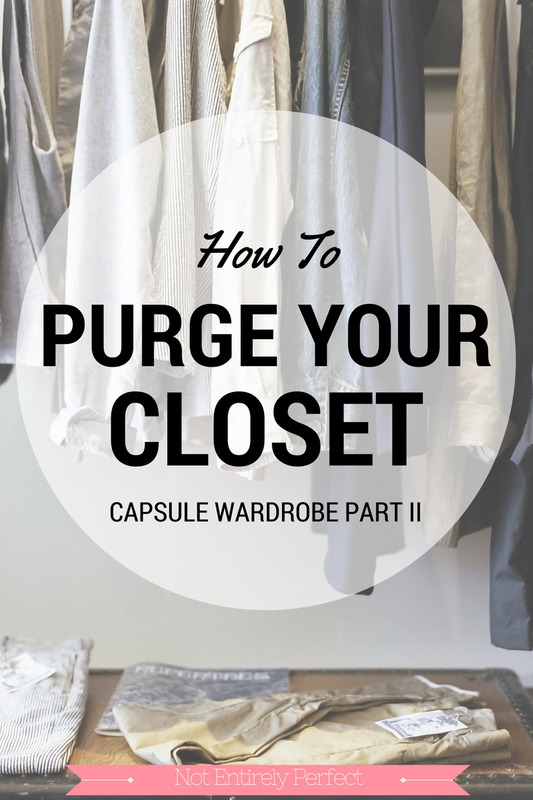 The next step in the process is to purge your closet of what you currently have that's not going to suit your style or capsule plans. 1. Keep only things you love and actually wear. I'm a big fan of the KonMari method for purging your house. 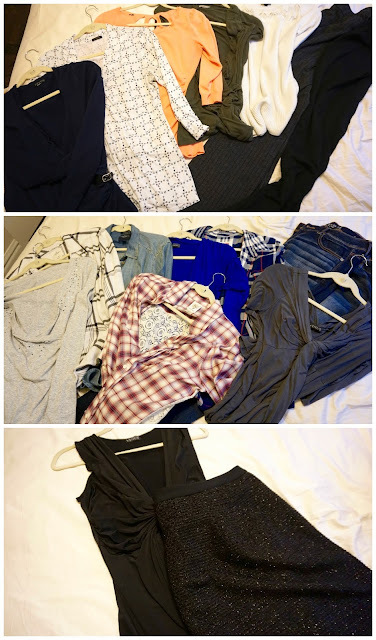 I think you really get rid of so much that way, and keeping what only sparks joy in your closet is a really good way to get to a capsule wardrobe and find your style. When you're sorting through each item of clothing, you really want to keep only things you love and things you actually wear. I can see how it would seem too simple, but that's the joy of the capsule wardrobe - simplicity. Do not keep things you think you're going to wear 'one day' or that you can't get rid of for sentimental reasons. Those items have no place in your capsule wardrobe. 'One day' stuff just needs to leave and the sentimental things need to go into another room, not kept in your closet. You should be able to hold each piece and quickly answer if you love it and actually wear it. If you hesitate, it's a very good sign that it fits neither of those criteria, let alone both. I understand the emotional need for a maybe pile, so if you must do it, bag that pile up immediately and put it out of sight. You probably won't ever open it again, so just donate it when you realize that. That's really all I consider when assessing an item - do I love it and wear it and does it fit within my 3 word standards? No need to complicate the process! Here's how it works in practice, with a couple of pieces that I've recently reassessed myself. Pink and Black Dress - I know that I love it and wear it regularly, it's comfortable. It's also feminine and classy, and it's simple because the black part that looks belted is actually attached and it just slips on over my head. It stays. Dark Blue Sweater - It fits in with my style, it's feminine, simple, and classy. But I don't love it. I'm never totally comfortable when I wear it because it's a little bit shorter than I like. I find myself tugging it down all day, which is just annoying. Into the donation pile. It's okay to be missing some key pieces, so if you feel like you're getting rid of way too much and will have nothing to wear, I'm going to address that in a coming post - how to get new, perfect pieces for your capsule wardrobe on a budget. Don't keep a sweater you don't love just because you haven't found a replacement yet. If you keep holding on to it, you'll never feel the pressure to go out and find something you love, and you're just wearing things that don't make you feel great for much longer than you should be. This is a good time to get used to just wearing those things you kept that you love - you won't even miss the sweater. You'll be surprised how comfortable you are with having less pieces once you realize how much easier it is to get dressed in the morning and how much happier you feel with what you have on when you love what you're wearing every single day. You may end up not wanting to add in as many pieces as you thought! The thing you have to realize, though, is that this is not a one time event. If you've never done a massive overhaul of your wardrobe (where you assess every single item) then this first time will be a doozy and I promise it'll never take that long again so don't be intimidated. But you do have to reassess your wardrobe on occasion. I say I do this at least once a year, maybe twice, like when switching from winter to spring and summer to fall. It's unrealistic to think you can make one capsule wardrobe and be set for life. Things change! Your tastes will change, your life circumstances will change, you grow and mature. And of course, the more you wear these items you love, the sooner they'll wear out and you'll need a replacement. (Although, I've had my beloved teal top since high school so maybe things don't wear out that fast if you buy them right the first time.) But it gets easier every time you do it and you'll be able to focus in more and more on what your true style is and get more comfortable with it. So follow the process and really take everything out that doesn't work and see what you're left with. Make a list of what you have and then another list of pieces you know you need to complete the capsule. There is no set number for this for me. In the next post, I'll talk about the different types of capsules out there and how to pick one that works for you, and that might have a defined number of pieces. But I'll also tell you what works for me, and why it's not a defined number. Until then, happy decluttering!